At the end of the 19th century, American quilt design was turned on its head by women making wildly embroidered, richly textured, shockingly asymmetrical “Crazy Quilts” from velvet, silk, and plush fabrics. 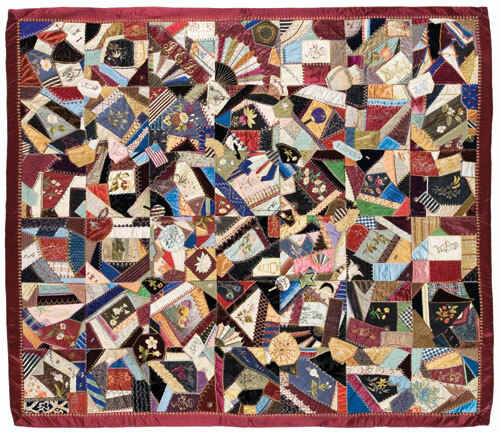 Henrietta Lambie, a Northampton resident, started a crazy quilt in 1884, at the height of the American “craze.” It was a memorial to the two children she lost in the 1880s, the first before she started the quilt and then a second soon after, while she was working on it. She cut the fabric from her family’s wardrobe, including dresses belonging to her two lost daughters. Some of the blocks were made by friends, and many were embellished with paint as well as thread. Many motifs have symbolic meaning, compounded by the fact that Lambie could probably trace the provenance of each patch. 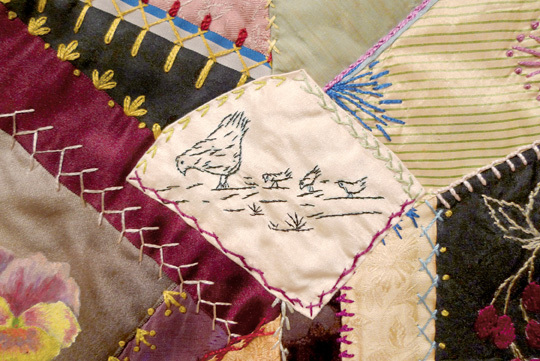 One can’t help but imagine the profound experience of making this quilt to remember her children, and the support of friends who contributed. 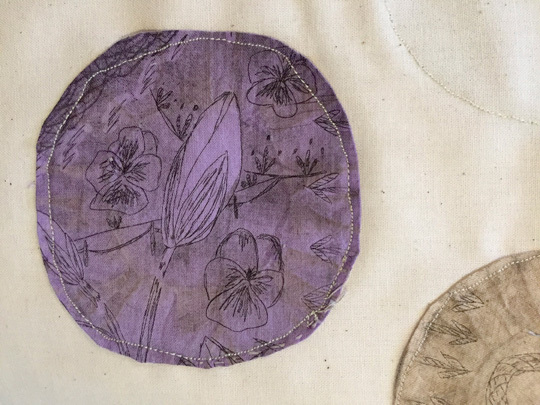 Keeping Busy includes the original artwork of five contemporary artists with varied approaches to textile art and a shared interest in history and women’s stories. 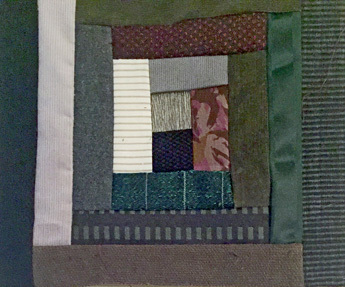 Each artist has created new work in response to Lambie’s mourning quilt, which will also be on display in the gallery. An exhibition catalog, including statements from the curator and artists, will be available at the opening. Click here to view the Exhibition Catalog online. Curator Esther S. White is an artist and arts organizer. Her curatorial practice is collaborative, with a focus on promoting the work of emerging artists and experimental art. She is a founder of Fugitive Arts, which produced this exhibition. Esther studied printmaking and photography at Barnard College, Columbia University (B.A. 2007), and the International Center of Photography. She is an instructor at Zea Mays Printmaking in Florence, MA and Snow Farm in Williamsburg, MA, and is a member of the Northampton Arts Council, Boston Printmakers, the Monotype Guild of New England, and the Surface Design Association. In her printmaking and textiles White explores women’s work and the decorative arts, walking the line between fine art and crafts. She lives and works in Northampton, MA. Angela Zammarelli received her BFA from the University of Massachusetts Amherst and MFA from the Minneapolis College of Art and Design in Minneapolis, MN. In 2011, she was named one of the Massachusetts Cultural Council’s fellowship recipients in sculpture/installation. Anna Slezak has recently been guest curator at Flying Object in Hadley, MA and part of “Related Matters,” a month-long exhibition at A.P.E. in Northampton, MA. Annie Sollinger is a librarian and artist. She earned her BA in Art History from NYU, and her MSIS from UT Austin. Her practice centers around photography, collage, zines, and fiber. Kat Howard is a poet, book artist, and fiber artist. Her work was featured in 500 Handmade Books: Volume 2 (Lark Crafts, 2013) and the Siberian Self-Publishing Festival, Tomsk, Russia. Lucy Trainor is a reproductive justice activist and quilt-maker living in Easthampton, MA. She is a staff member at the Civil Liberties and Public Policy program and serves as co-chair of the Prison Birth Project's fundraising committee.